Don't waste your money. We bought a front loading washer because we heard they were supposed to be very quite. This machine is ridiculously loud. We've had service technicians come out twice to look at it, and they say it is operating as it should. If this is how their engineers designed this machine to work, they are crazy! I was at the other end of my house when my machine was running one day, and thought I heard a helicopter outside...turned out it was just my washing machine. I am not exaggerating even a little. My advice...do a little research on different brands and stay away from GE. Customer service was no help either. Basically told me they were sorry to hear about it and goodbye. Cleans well, saves water. After 8 years it needs a bearing, so what? I'm capable, I fix things. Face it, it's a mechanical device. Never a smell issue ( I leave the door open, duh). Ignore the helpless whiners. Bought our machine in 2006. Replaced the warped drive pulley and belt in 2012 due to the horrible noise it was making. Ran ok for awhile. Noticed noise again a few weeks ago, just no time to stop and tear it down. Took apart today to find the belt off and black dust all inside unit. The drive pulley once again needs to be replaced. This time, however, it has rubbed a groove in the outer drum at the top. Not sure if it is gonna leak. I ordered another drive pulley for $75.00 and will replace only one more time. If the drum leaks where the groove is cut, I will try to patch with a heavy epoxy. I refuse to buy a $250.00 drum. I paid $900.00 for this machine new. It has had two main brains put in while still under warranty before all of the problems with drive pulley. I will NEVER by a GE product again! Well guess it is my turn to feed the beast. Bought ours about 4 years ago and have never liked. They were hugely expensive but have never really cleaned as well as my top loader. Saving water is great, but not if your clothes come out smelly and dingy. Now the pump has failed. Repair is $300.00!!! Run away - don't buy into this fad. Get a decent top loader and save yourself money and grief! Bought a WBVH6240 front loader and the bearing is bad. Repair man just told me that to fix it would be 600 dollars. But after reading all the other comments on here about the other problems that's going on I believe I will buy a whirlpool top loader. My GE WBVH6240FWW washer stopped draining. Found the pump that extracts the water was just setting there vibrating not turning. So after researching found that the pump motor is the same on a lot of models, just the manifold it attaches to is different by machine models. The complete replacement for mine was $130.00. I found one with same pump motor for $18.00+shipping and just exchanged the pump motor. Put together and it worked great. Happened to notice a little water in bottom tray of machine, got to looking and tub is cracked on upper right side in rear. Absolutely nothing attaches neer it or touches it . I can't believe what a cheap made washer. And now I see all the different complaints on the Webb it's just crazy. So, no more G E For Me. My mother always hated GE ,now I know why. Its funny - well actually not but I have same out of balance washer problem. Does not take a rocket scientist to figure out it was bad design. Really? A cast Aluminum pulley and a solid steel drum shaft? No doubt designed for reducing washer cost and designing to fail. Oh did I mention I am a design engineer. No more GE washers for me. I CAN SAY THAT MY WASHER WORKED GREAT FOR ABOUT 5 YEARS THEN THE SHAKE STARTED. FOUND OUT THE PROBLEM IT IS THE DRUM BEARING, WHICH YOU MUST BUY THE WHOLE WASHER DRUM BECAUSE YOU JUST CAN NOT REPLACE THE BEARING THE COST RANGES FROM $268.37 FROM SEARS AND HIGHER FROM OTHER PARTS DEPT. I WILL BUY ANOTHER ONE. My last post I was going to try fixing the shake problem. After I replaced $200 worth of parts, the shake continues. I'm not sinking any more money into this machine. However, I am giving GE a second chance. 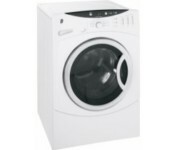 I've purchased a new GE machine (to match my existing GE dryer). If I run in to problems early with this one, I'm done with GE. No Extended Warranty. My replacement is GFWH1400DWW. GE 6240 I got the only good one. Reading the comments here makes me count my blessings. We've had very few problems with my machine. We've owned it for over 7 years. I've only cleaned out the drain trap 3 times since I found out it existed. It was quieter than our old top loader. Only now am I experiencing the shake problem that others are talking about. I'll be researching this. Maybe my comments will change after this experience. I wished I had seen the owners' comments here before I bought this POS. And to think it was highly rated in Consumer Reports too. Must have been one of those "Initial Quality" scams. Never again my friend, NEVER. When the washer was 2 years old, we moved, and relocated it from a concrete floor to the first floor. It shook so bad I thought it was going to crack the drywall, so had to spend $50 on anti-vibration pads. It still made the dishes in the kitchen cabinets rattle, but we could live with it. Now that it's 6 years old, it is vibrating and thumping worse than ever. We replaced the anti-vibration pads, and also replaced the shock absorbers in it ($200 total). I also regularly clean out the drain trap, and checked the belt, bearing, and pulley in the back (still ok). Yet somehow the tub is out of round. I can turn it by hand and see that the edge of the tub varies by at least half an inch. I guess it gets at least 2 stars because it didn't outright die yet. But it might be easier if it had. Holy Cow! I've owned my GE Washer for 3 years and have had it repaired 4 times. This last time, the repairman said $200 for the water pump and $100 to fix it. Nope. Not going to fix it this time. Just bought a top loader and no a GE one, either. I'm not a sucker! I will NEVER EVER EVER buy another GE product as long as I live. The worst customer service for a lousy product. Paid $800 and have over $700 of repairs into it. Screw you, GE!!! We purchased our washer and dryer in 2007... I just got back from lowes where I bought a whirlpool replacement. Had the lemon for five short years and had three service visits. The latest was going to cost $500. I agree with the earlier blog, make sure you clean out the hidden trap or your clothes will not spin out. I agree. I have had to replace my belts 4 times and he drive pulley three times. The drive pulley is made of soft metal and you have to use a rubber mallet to get it n=on the machine, Then you tighten the nut to snug and add a 1.4 turn. The problem is the drive pulley wears and begins to wobble causing the belt to slip of. You can try to fix it by tightening the nut but that only fixes it for a short while. In addition, the washer has a hidden coin and debris catcher. You have to take the front bottom off to find it. If you do not clean it out, then you risk damaging the pump. The design engineers at GE should be let go, they have no idea what they are doing. I am sick and tired of these GE products. THey do not bring good things to light. I purchased the GE front loader washer and dryer with the pedestals, all I can say is, it looks great... I purchased in 2006, by 2008, the washer had to be replaced due to the whole drum breaking off little by little. In 2009 the gasket had to be replaced. Now when I initially purchased, I got the extended warranty. I am 3 months out of warranty and now the washer will not even power on, there was no indication of anything, GE products have become lousy products, Everything in my house is GE, because I grew up with GE, through my parents, grandparents & great grandparents. I am so very disappointed with GE right now. Their manufacturing process has really changed, company's just don't care about customer satisfaction anymore. Purchased this washing machine in 2006. In December 2010, we noticed that the door gasket was ripped and the washer was leaking. I replaced the gasket at $116 and then noticed that the belt was hanging halfway off the pulley. When turning the pulley, I could see the pulley wobbling. Then I noticed that three of the spokes on the pulley were cracked. This explains the torn gasket and the loud noise during spin cycle that we had been hearing recently. If your door gasket has torn, I would suggest checking the pulley! The gaskets are too expensive to keep replacing. This washer, by far, is the WORST appliance I have ever owned. It was purchaed May, of 2006, by November, 2006, it had to be repaired, then REPLACED. Are you kidding me? Now, it's broken again. Lights go on, no ONE'S HOME. It's a useless piece of you-know-what. For this kind of money, I could've bought 2 washers and a dryer. THAT WERE RELIABLE AND USEABLE. I had my old Whirlpool washer for over 15 years, and not 1 day of trouble, just had to replace the agitator, big deal. Now, I have to drag loads of laundry to a local laundromat? Seriously? Really? This is a effen joke. I have had my GE Front load washer going on 3 years and i have had nothing but problems It gets off balance all the time no matter the size of the load. The repair guy has been out an couldn't see anything wrong. If I could get rid of this washer I will never buy a GE again. We bought this GE washer two years ago and already need to replace it. It works only when it wants to, it leaks, and tears up my clothes. Not to mention the clothes come out WRINKLED and it takes over 2 hours for a load of laundry to wash. I cannot start laundry past 7:30pm or else I will be up past 11pm waiting to finish the same load of laundry. Yes, we have had GE come out - multiple times - and they wash their hands of it. They say it is working as it should. Now I am going back to Best Buy and demand they give me some credit for selling me this horrible washer. I will never buy GE again! I can not believe that my GE Profile front load washer that I just bought not even 4 years ago needs to be replaced. I heard a banging noise coming from the washer and thought something must be unbalanced, so I checked and everything was fine. Then it started spinning very fast, leaking on the floor and making loud noises. We called our neighbor who repairs appliances and he came over to look at it. We were told that it would be better to replace the whole washer then to buy parts for it. I am so mad!!! What ever happened to the good old days where appliances lasted for 20+ years???? I would have been happy for 10 years. We will never buy another GE Product again. All I can say is the gasket in the front of my washer was ripped apart because of the vibration. We were warned a year after buying the washer the gasket would be destroyed-and they were right. After the service calls on a 3 year old washer I'm done. This should be done about every 3 months. Yes- my GE front loader makes a lot of noise when spinning (after 4 years). It is probably the rollers/bearings that the drum sits on. Yep,same issue with the GE front-loader. The machine "walks" all over. We even had the spin cycle (which sounds like bricks) knock the hoses off in the back, flooding our laundry room. My husband had to brace the washer with 2x4's on every side to stop it from hitting the dryer, cracking the counter or flooding us again. Biggest hunk of crap ever. What a waste of $$!! Doesn't spin clothes properly leaving clothes soaked and dripping wet. Terrible. The front load machine I use does NOT use enough water to clean clothes. This is true of similar the units made by other companies such as Samsung, LG and Kenmore. At any point during the "wash" cycle, there is not enough water in the unit to clean the clothes properly. The idea behind the unit is to save water. Fine but it "saves" water at the expense of electricity. The top loading units run for 25 - 30 minutes. Front loading units like this one take 59 minutes to run a typical wash cycle. During the wash cycle the unit turns then stops turning constantly. Electric motor inrush current to start the motor turning is 3 times greater than steady state running. Environmentally, these type washers are environmental disasters. This washer is not fit for manufactured homes. It shakes so badly that it even walks. Pictures on walls, items on tables, etc. all shake, not to mention the whole home. If I could, I would go back to a top load washer. I can't even get a decent answer to how to repair the problem. It is leveled, no shipping bolts, and even on pads. Save your money, don't purchase a GE. My machine has not been as troublesome as others listed here (knock on wood)...Occasionally the load doesn't fully drain; I run another rinse/spin cycle, and the problem is solved (still a bit of a nuisance). However, the door seal is torn; disconcerting since the machine is only 3 years old. To replace this will cost about $97 (GE charges $152) and a few turns of a screwdriver and/or wrench. All-in-all, not a perfect machine - my Lady Kenmore (top loader bought in 1984) last 20 years, no problems. The worst washer I have ever owned! I have to drain excess water after every load. (I clued into this fact when our laundry started to smell awful - like stagnant, filthy water.) I use minimal HE detergent, but there are always suds left over. Basically, it's a pain in the neck and I will never purchase another GE appliance again! why did i buy this !!! This washer will not last more than three years. My first front loader and it leaks, the belt is broken and you constantly have to remove the bottom cover to clean the pump trap. The machine dryer is even worse, main power board went out. Run from GE. After hours trying to figure out the noise, I noticed that besides the metal shipping bolts that my installation guy had taken out, there is also four plastic/rubber shipping bolts (braces) that should also be taken out. Please check to be sure these plastic/rubber shipping bolts are also removed. If you look on the back of the washer, you will see four rubber "feet" with a hole in the middle where the metal shipping bolt used to be. Well, grab those rubber "feet" and give it some really hard turns to pry them out. Once they are out, you can cover the hole with the adjacent plastic covers which should be hanging next to the hole. We bought our GE machine in May of 2006 from Lowes for $800. After the first year, just out of warranty the machine needed to be repaired. After the second year the machine sounds like it has bricks in it during the spin cycle and also needed to be repaired again due to leaking. This past weekend the belt broke. I ordered another belt for $70.00 and found that the drive pulley is also worn due to all the vibration. The pulley kit will cost another $70.00. If I had a repairman come out it, the cost would of been $100.00 for them to pull in the driveway, then finacial blood sucking begins. I will not buy another GE product or a frontloader again. At this point I am thinking about putting a stake in this vampire, cut my losses, put this still new looking washer on curb and buy a $200 top loader. Our last one lasted 15 years when we donated it to charity and decided to upgrade to this piece of junk, what a joke !! Our washer has become increasingly noisy over the past number of months. I pulled out my users manual, checked the troubleshooting section, which led me to the installation section and found that the shipping bolt/braces had been left in. Check your machine and check it twice before you run it. THIS IS THE WORST WASHER I HAVE PURCHASED IN 20 YEARS. I BOUGHT IT IN FEB. OF 2008 AND IT STARTED LEAKING IN JUNE OF 2009. I WAS UNABLE TO GET ANY ASSISTANCE TO GET IT REPAIRED FROM LOWE'S WHOM I BOUGHT IT FROM NOR GE THE MAKER OF THE PRODUCT. THIS WAS A TOTAL RIP-OFF FOR $800.00. I WILL NEVER PURCHASE A GE PRODUCT AGAIN NOR WILL I EVER BUY AGAIN FROM LOWES. With a full load, a tight inner core of items forms during the wash cycle. Logically, that tight wad of clothes simply cannot be adequately washed or rinsed. I don't own a GE washer, but my mother-in-law's washer sounded really horrible and extremly loud. Our handyman suggested checking to see if the shipping bolts that are installed during the shipping process might not have been taking out. After that it quit shaking the house down.